When you turn 18, you’re considered an adult. Your 20s go by quickly, and your 30s make you start feeling your mortality a little more. 40s you’re over the hill, but when you reach 50, you’re at what some people call the “half way mark”. Many people dread their 50th birthday because it becomes clear to you that you’ve more than likely lived over half your life already. This is not the time to have financial issues and troubles, but many people in their 50s and even older still do have issues. According to US News, the new “ideal” retirement age is 67 years old, which has gone up by 7 years since 1995. This could be for many reasons, including the economy making it more difficult for people to forgo their primary income for the remainder of their lives. Financial insecurity is a huge factor when determining when people would like to retire, and when it’s realistic to retire. In the United States, social security, which has been a form of income for retirees, is in jeopardy, and may not be available for many workers now. You also have less businesses offering 401(K) retirement plans, and if they do, very few companies are matching employee contributions. So being able to retire comfortably is going to take longer for many workers. Having a stable career is going to be crucial once you reach the age of 50. The older you get, the harder it is to find a job in some industries. Yes, companies want prospects to have the years of experience under their belt, but they also want the youth that comes with it. If you do feel that you’ll hop to a few different companies over the years, be sure that you have the years of experience. This is not the time to switch industries and start from scratch. It’s ideal to start saving for retirement as soon as you enter the work force, but some people get started later than others. Hopefully, you’re at a job that allows a retirement savings plan in its benefit package. Take advantage of that, and try your best to max out your contributions every year. When you turn 50, you’re allowed to increase your contributions to your IRA and your 401(K). An extra $1,000/year for your IRA and an extra $5,500 to your 401(K)/year will give you an extra $110,500 just in those 17 years alone. Make necessary adjustments to contribute as much as you possibly can. Debt is not fun to get in to, and it’s hard getting out. If you want to enjoy your 50s and beyond, you’ll want to focus on savings, not paying off debt. By your 50th birthday, make it a goal to get rid of credit card debt, student loan debt, personal loans, and even your mortgage and car note. Depending on when you bought a home and what type of loan you chose, you’re probably in your last years of paying for your house (unless you refinanced). Aggressively pay off your debt so that your net worth increases, and you can focus more on saving money rather than paying it off. These are pretty huge goals, but if your 50th birthday is a ways away, you have time to do what it takes to accomplish these goals by the “deadline”. Find a job that you love and will want to stay at. Start contributing to your retirement savings today, especially if your employer will contribute to it as well. Pay off your debt now so you won’t have it to worry about later. 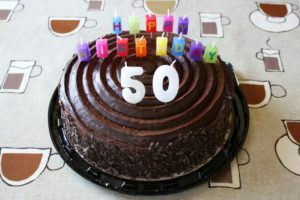 When you reach 50, you can celebrate a milestone birthday and financial milestones as well.